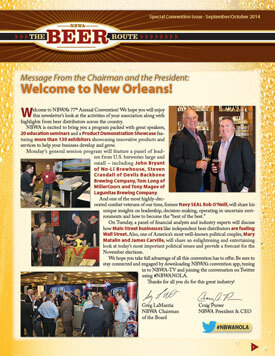 Read the special NBWA 77th Annual Convention issue, which provides a look at the activities of the National Beer Wholesaler Association, including membership programs and services. Read a message from NBWA's incoming chairman of the Board of Directors, why warehouse visits are key to building relationships on Capitol Hill and how NBWA is engaging with beer bloggers. Also read about NBWA's Share Your Story Contest, the Next Generation Group, the Craft Beer Distributor of the Year Award and more.